After the natural disaster which hit the Dolomites (as well as other areas in Italy), devastating Serrai di Sottoguda (BL), the locals have come together to rebuild this highly symbolic place. The Board of Directors of the UNESCO Dolomites Foundation voted unanimously to support the project to rebuild Serrai di Sottoguda in the municipality of Rocca Pietore (Belluno). “The calamity which affected the length and breadth of the Dolomites hit some extremely symbolic places which give access to the UNESCO World Heritage Site”, commented the president of the UNESCO Dolomites Foundation Graziano Pizzimenti, “including Serrai di Sottoguda which is an important tourist attraction. The project to rebuild Serrai di Sottoguda is an opportunity to safeguard its landscape and geology and enhance its aesthetic and scientific features”. 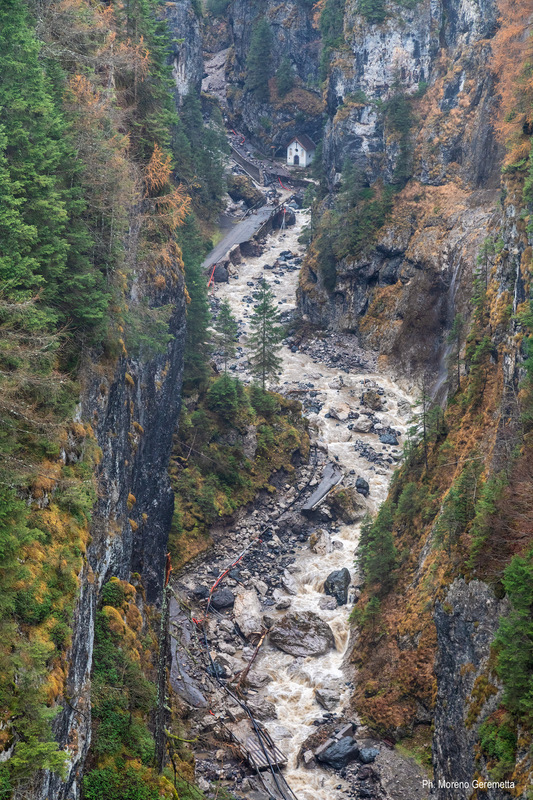 The flooding at the end of October basically destroyed the road along the gorge, demolishing the bridges, the walls along the banks and the retaining walls and it carried away all the material from the bed of the Pettorina stream. to restore flow and absorption in the riverbed and make safe the water and soil, coming up with innovative solutions with minimal impact which adapt to the ever-changing climate. to enhance the geology, geomorphology, landscape, history and documentary evidence of one of the gateways to the World Heritage Site. The UNESCO Dolomites Foundation will work with the local administrations, drawing on its experience enhancing the World Heritage Site, to launch a competition to come up with the best idea for the rescue project, taking into consideration the many different aspects involved in such a reconstruction effort. The overall cost of the project will be around Euro 6 million, of which approximately Euro 200,000 is allocated to the design stage. a crowdfunding competition (10-15% of the total cost) whereby backers will have the chance to become supporters of the Foundation or be included on a list of benefactors (“Friends of the UNESCO Dolomites World Heritage Site”). “My community is worn out – said the Mayor of Rocca Pietore, Andrea De Bernardin – “Every day we are out there, trying to get back to normal, no one’s going to give up. Serrai, in particular, is an invaluable resource for us and it is known and loved throughout the world: it is an outstanding natural phenomenon, and still is after the events of 29 October. Access will be restored and we hope this will happen as soon as possible. It’s a clear sign of our unity. I’m grateful to the UNESCO Dolomites Foundation for taking on board our idea of a competition and, especially, for its offer to fund the design stage”. “Serrai di Sottoguda is a priceless gem in the extraordinary treasure chest that is the Dolomites. Its landscape is of exceptional value and it is an important tourist attraction” commented the Councillor for Tourism of the Veneto Region, Federico Caner. “This resource may have temporarily lost some of its magic, but we will restore it to its former glory. We mustn’t stop at just repairing it, we must make Serrai a workshop for innovative solutions regarding accessibility, use and protection. And who better than the UNESCO Dolomites Foundation to lead this exciting venture, with its ability to bring together ideas, expertise and enthusiasm to help the areas most hit by the events of 29 October?”. “It is a clear signal of solidarity in such a difficult and sensitive time for our area. It has been made possible thanks to the support of the other members of the Foundation who unanimously voted in favour of this project” commented the president of the Province of Belluno, Roberto Padrin.